After taking it easy on day three, we were ready to make the most of day four. This worked out perfectly because weather-wise, the rain had passed and it was a bright and sunny (though bitterly cold) London day. 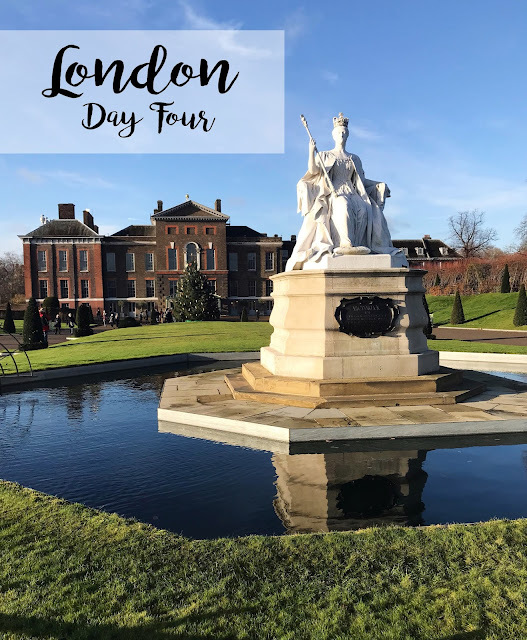 Parker and I aimed to tackle everything that was on our schedule for the day, while also adding in our Kensington Palace tour since we missed it the day before (and Max would be attending the second and final day of his conference in Chelsea). Looking back, I can't believe how much we packed into just that one day! I woke Parker up around nine - he seemed so much more well rested than the morning before! 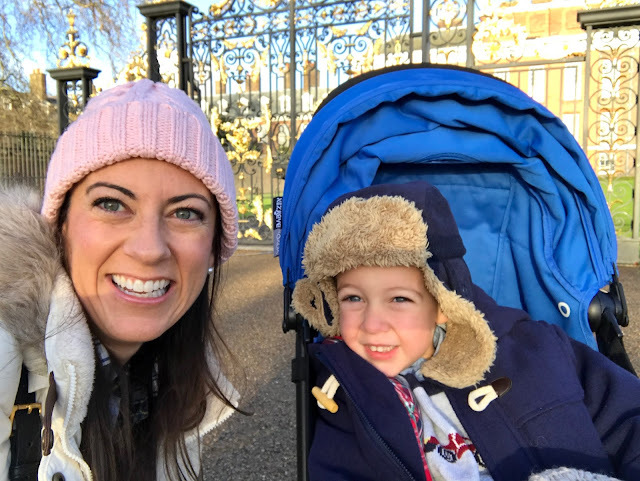 We started our day with breakfast in bed (for Parker) and then a walk to Kensington Palace! While we would have loved to have toured Buckingham palace, it's not open to the public in December because the Queen is in residence. Kensington Palace seemed like a good substitute, and - bonus - it's home to my faves, the Duke and Duchess of Cambridge (plus Prince Harry and Meghan Markle!). Of course, we toured the ceremonial part and not the residences, but we were still excited to be there. Our tickets were date-stamped for the day before, but luckily they still honored them. 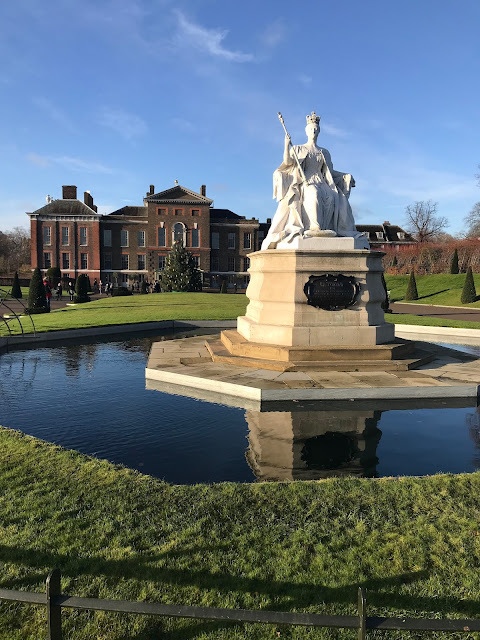 A line had already formed before the 10AM opening, so we moseyed over to the Queen Victoria statue while the first group of ticket holders was let in (those without tickets were corralled to the side to wait). In front of the statue, there was a sign with one of those QR codes to scan, and when we did we got an incoming "call" from Queen Victoria on my phone - so clever! When I saw the line for the palace dwindling, we walked over and were let in at the end of the ticket-holder group, while those wanting to purchase tickets were still left to wait (score for purchasing online!). Kensington Palace is one of the places where it's awesome to have a pram. To access the "lifts" (elevators), you're escorted through back rooms and short-cuts by attendants (plus, it gave us a place to store our coats!). I loved this mirrored elevator (and Parker loved the Kids' Guide to Kensington that I preordered for him when I bought the tickets - we just showed the voucher while standing in line and they had a stack of them to give out right then and there). New to the palace is the exhibition Diana: Her Fashion Story, which was so touching to see in person. 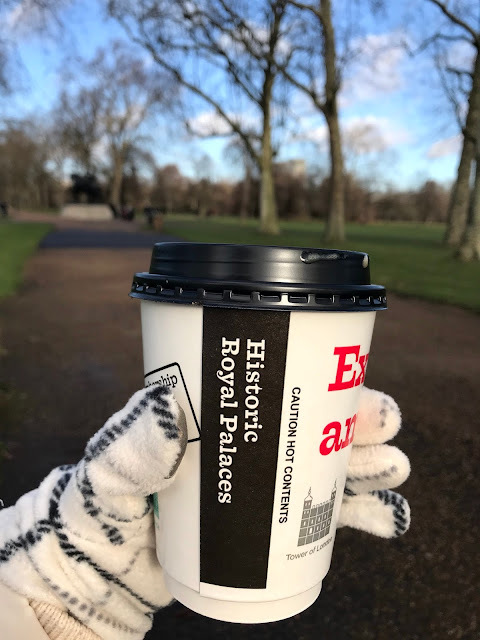 I grabbed a cappuccino on our way out, and we checked out more of Hyde Park. 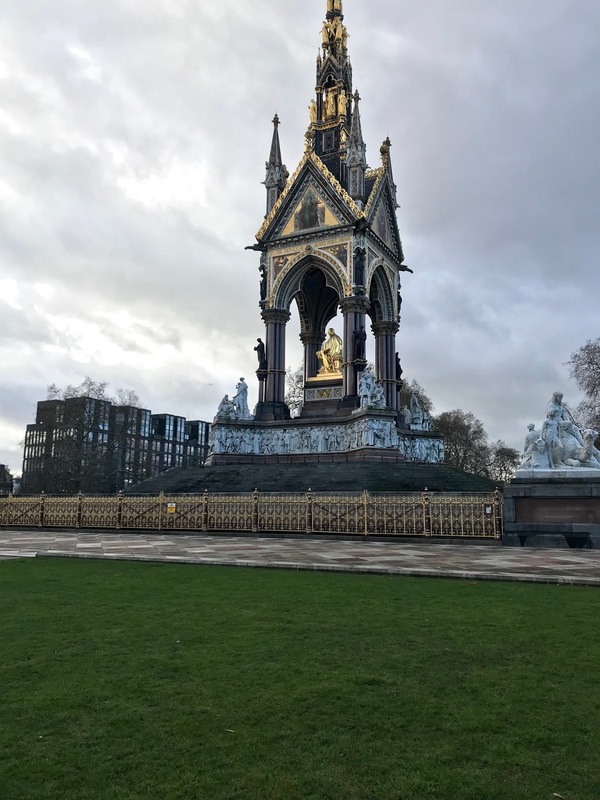 We passed the Albert Memorial on our walk back to the hotel. 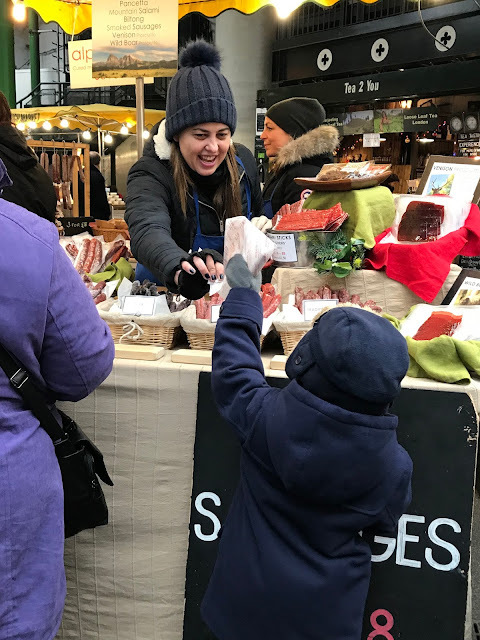 We freshened up in our room then hopped on the tube to head out to Borough Market. Parker had read about it in one of his books and had been asking when we'd go. The area was also home to the handmade pasta restaurant I was dying to try. Parker was so comfortable riding the metro! It was super full at some points, but almost always someone would give up his or her seat and insist on Parker taking it (he did do the stand and ride a few times, too). He had a little routine whenever we got off, he'd stop and check the boards to see when the next train was coming - you could say he was obsessed! 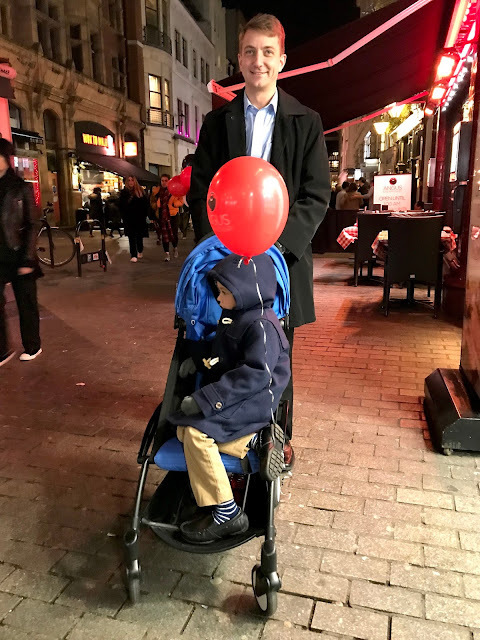 And just for reference, this is our BabyZen Yoyo+ (rented for the week from AirTots) with me at my seat on The Underground. It was just like having a bag - brilliant! Borough Market was even more darling in person than in our books. It was open-air but covered overhead, and had tons of stands and stalls with foods and goods. 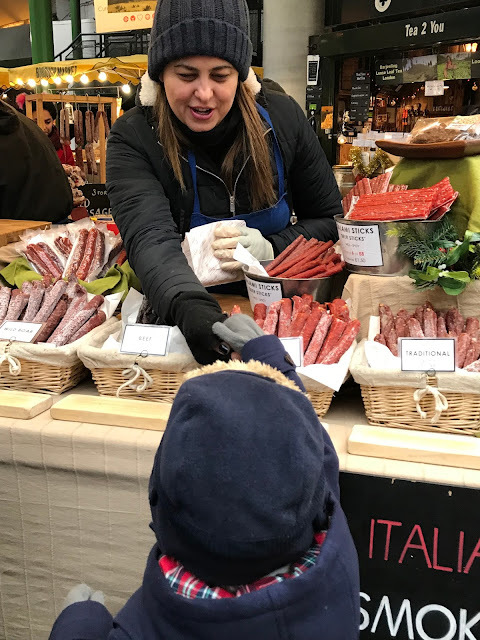 Parker could select one thing to purchase, and after circling everything he decided on a smoked sausage. He did the entire transaction himself and made a friend in the process! He was tickled to be able to use the coins he had been carrying around in his pocket - and even more excited to get change back! 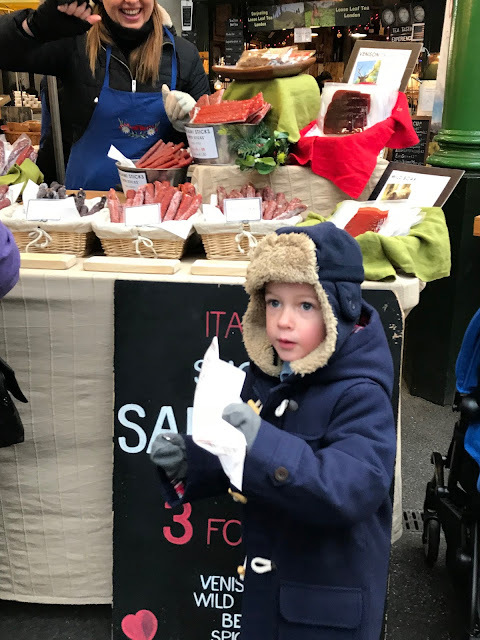 Armed with the sausage to keep Parker occupied, we ventured over to Padella, the handmade pasta restaurant, to check out the queue. 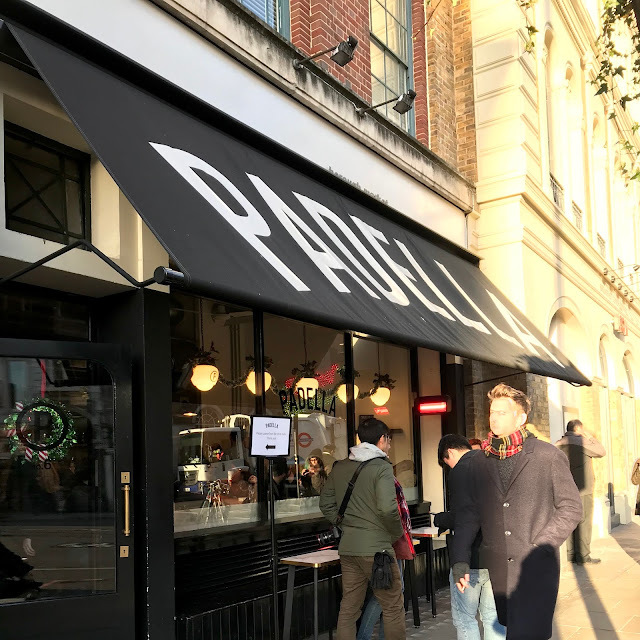 Padella was one of the restaurants I had researched that was recently given a Bib Gourmand (what the Michelin company awards more casual type restaurants instead of stars). I had read that the wait for dinner could be hours long (they don't do reservations), but was hoping that the lunch wait would be more reasonable. The line actually started on the side of the restaurant and went around the back. We hopped in around noon thirty, and more people joined in back of us which is always a good thing (the couple behind us had already tried and failed to get a table for dinner on a separate occasion). Our wait was only 15-20 minutes (long enough for Parker to finish his sausage). Once we were seated, I wondered if England had fire marshals, and if so, how what was going on in there was ever cleared (#kiddingnotkidding). It was packed. The ground level was bar stools only, but luckily we were escorted to the basement level that had actual tables. 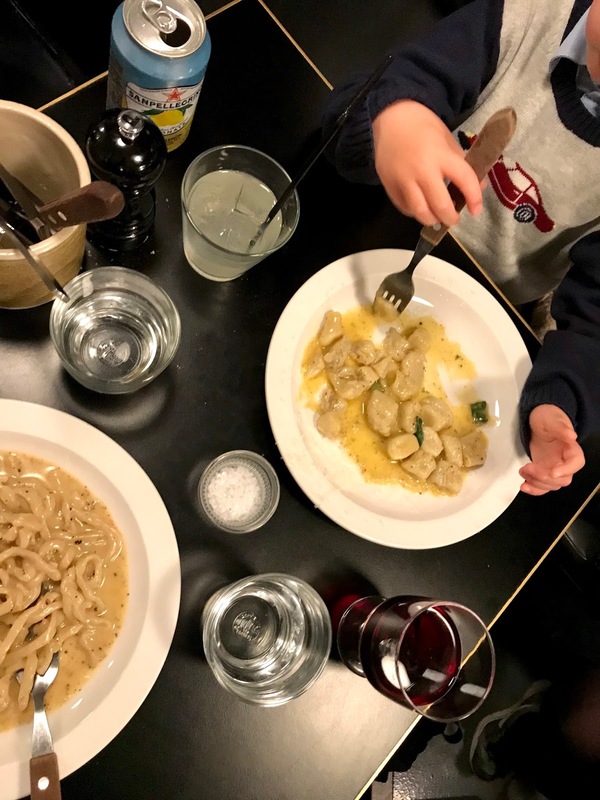 Parker ordered the gnocchi with sage butter and I had the pici cacio & pepe (cheese and pepper pasta). Both dishes were freshly handmade and outstanding (though I feel that maybe the excitement of the recent Bib Gourmand award contributed to the current crazy demand of customers). And if you are wondering if that's a glass of wine with my pasta, why yes, yes it is. Vacation lunch wine for the win. 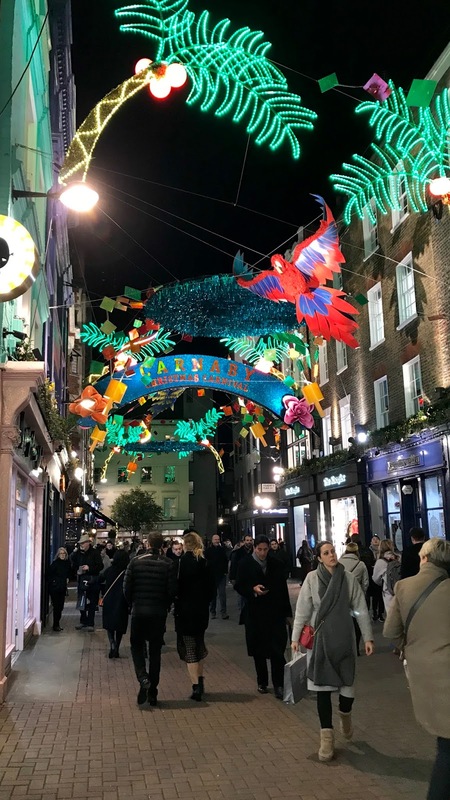 It's just a ten minute walk from the Borough Market area to The Tate Modern, London's modern art museum (like Washington D.C., most of the museums are free of charge). We took this photo for Max since he's a Salvador Dali fan. 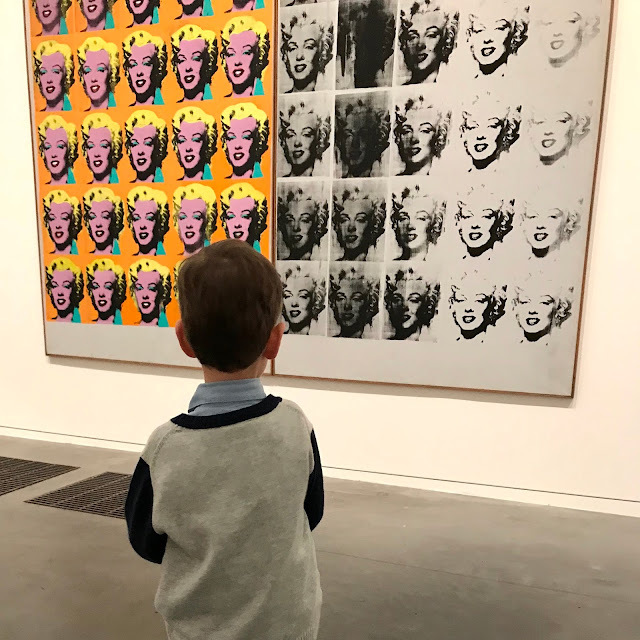 We also checked out some Andy Warhol. Parker's very favorite was this installation piece - a giant mirrored sphere that swung back and forth over a sloped carpeted area. He was dying to get down there! I must say, it was very zen-like and therapeutic watching the sphere go back and forth, back and forth. Parker and I left the Tate Modern and headed across Millennium Bridge, which looks like it goes straight into Saint Paul's Cathedral from this vantage point! The view to the East gave us a glimpse of Tower Bridge way off in the distance. I missed this Christopher Wren masterpiece on my first visit, so I was happy to finally see St Paul's Cathedral in person. 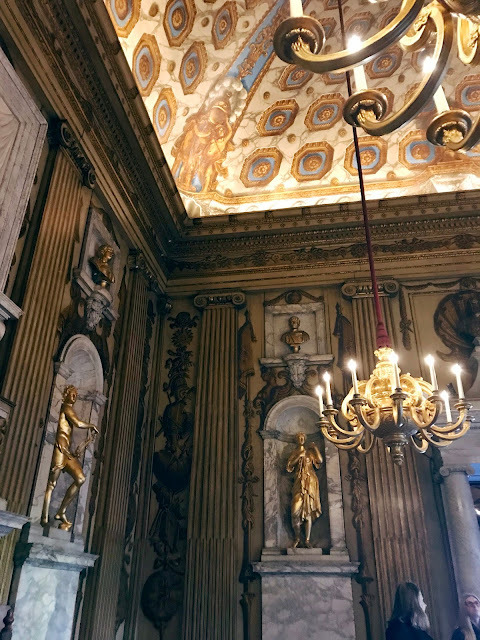 We were a bit early for the Evensong service that I wanted to attend, but should have been able to do a tour (it was 4pm, tours were open until 4:30 daily and the evensong started at 5:30pm). Unfortunately for us, there was a special Christmas concert that evening, but not until seven (and the cathedral would be closed until then). The last time I had checked the website, this event wasn't on the schedule (but the guard told me during the holiday season the schedule changes a bit). There were two women (I'm guessing from Spain) who were trying to get the same information from the guard but were only speaking Spanish, so I got the opportunity to bust out my rusty Spanish and translate that they could come back for a tour the next morning at 9AM or wait to see if extra seats were available for that night's concert. For Parker and me, that would have just been too much waiting out in the cold, so (sigh) we had to leave without seeing the inside of the cathedral (just another reason to go back someday!). 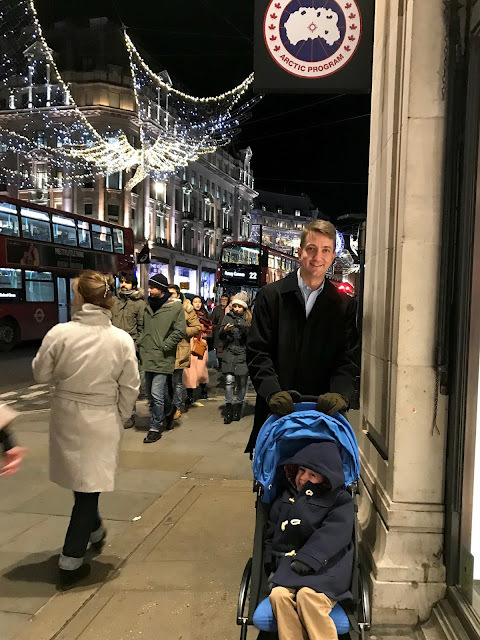 We had time before Max would be out of his conference, so we took The Underground over to the Holborn stop so we could go into the British Museum (again, free!). It was beginning to be rush hour, and both the tube stop and the area were packed. Even with my GPS I had trouble navigating with the crowds and the intersections that had six or eight roads instead of four (none of which I could find names for!). We finally found our way, and were able to walk right in (during peak hours the queues for security can be long, but we were close to closing time). We went directly to the Rosetta stone, which I had been so eager to see in person! Their Egyptian collection with mummies and art was another favorite - it was so crazy to think these pieces were thousands of years old! 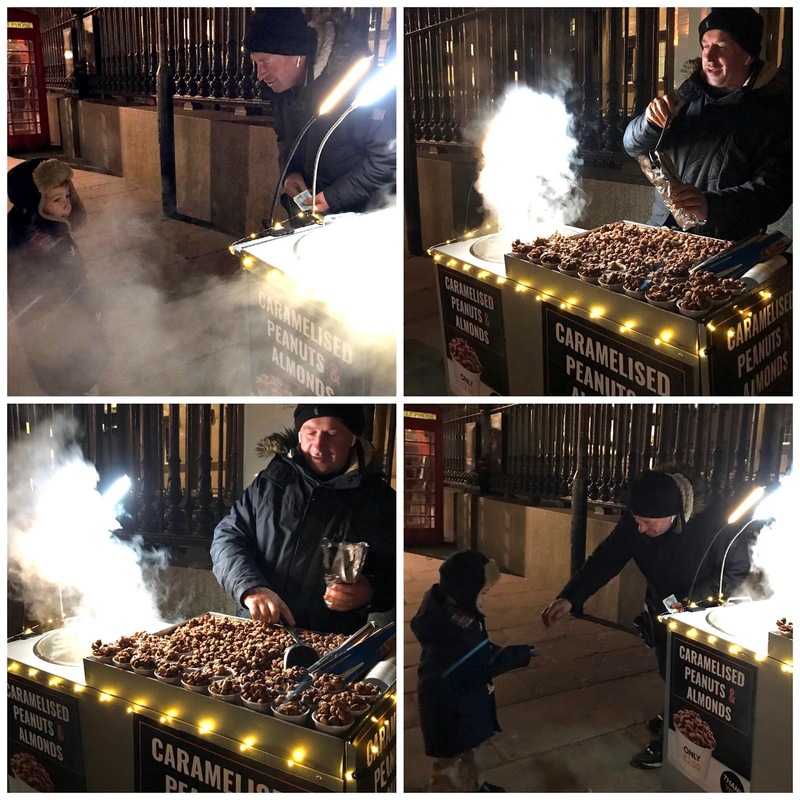 I promised Parker on the way out we'd stop for some caramelised nuts - he had been seeing stands for them all day and asked about them every time. He of course remembered as we were exiting, and once again got to do an exchange with British currency. From there we took a very crowded tube ride back to the hotel where we met Max. We didn't have set dinner plans that night, but I knew I wanted us all to see the lights of the Picadilly Circus area on one of the nights, and this one seemed as good as any, so off to Oxford Circus we went on The Underground (I can't tell you how nice it was to have our hotel right across the street from a tube stop). The Underground was crowded... like, shoulder to shoulder moving through the hallways crowded. And Oxford Street was bustling. The Christmas lights were so pretty and the whole area was just so lively. I snapped this photo of Max under the Canada Goose sign. Their logo looks exactly like the ones on the gear and clothing doled out to the scientists at the South Pole (Max went in 2009 as part of his thesis work at Stanford). He had seen a few people wearing jackets with the logo around the city and almost stopped them to ask them about their time at pole (it's an exclusive little club) before he realized the coats were just from this store. 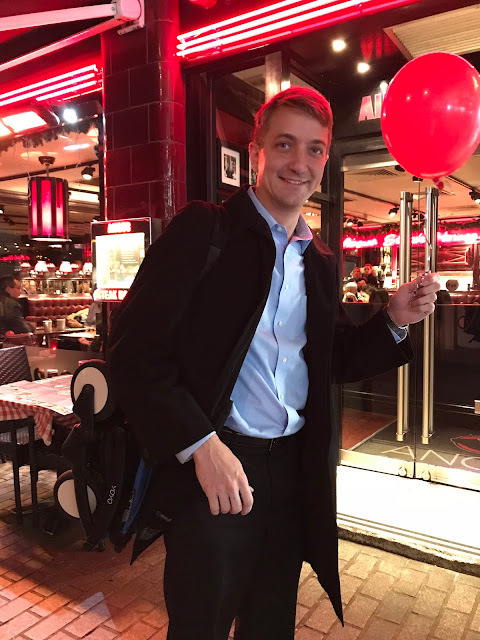 Parker really, really wanted steak for dinner that night (#growthspurt), but when we popped in the Steak Frites chain we had heard good things about, the wait was two hours. Eeeks. 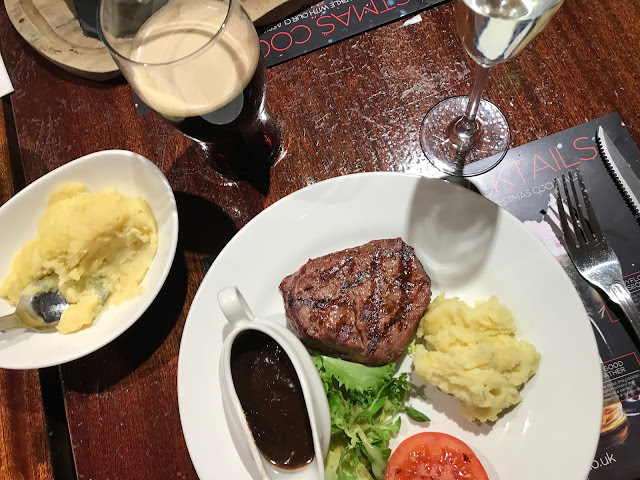 We ended up at Angus Steak House, which also had a wait but not nearly as long (also, the hostess was amazingly friendly and accommodating, especially to our little guy). 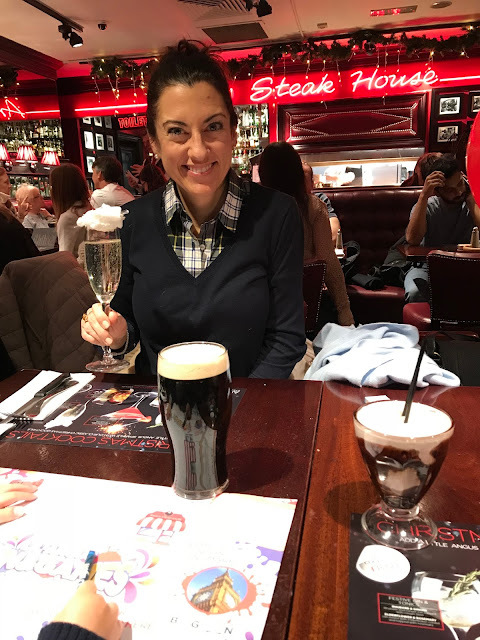 Christmas cocktail? Don't mind if I do! Prosecco + Candyfloss (cotton candy). All the heart eyes. 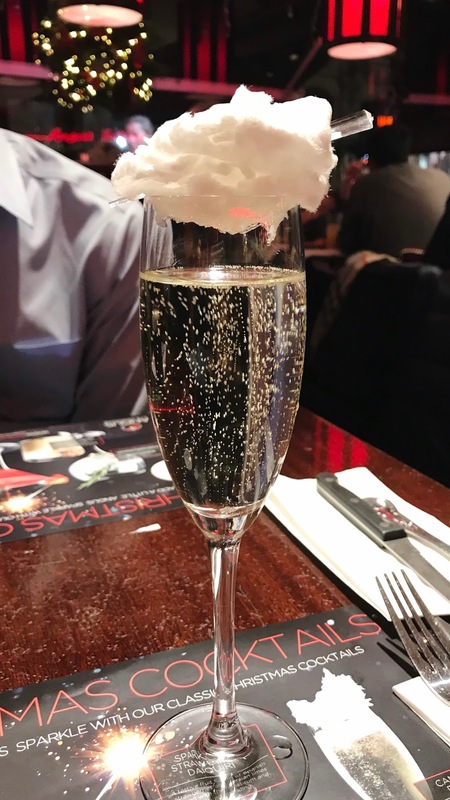 I mean, why aren't all glasses of bubbly topped with candy floss?!? 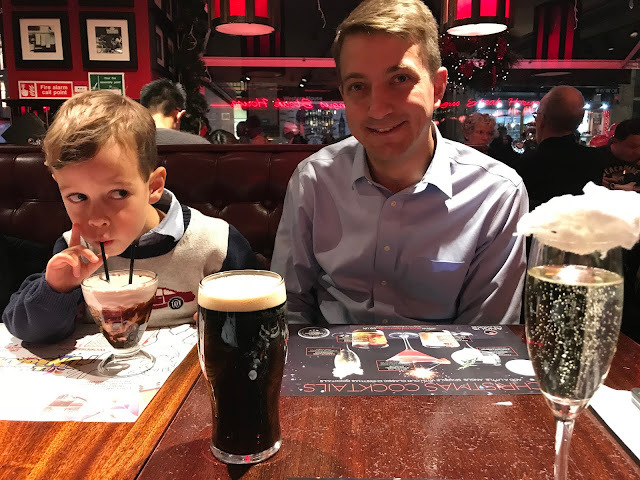 Husby opted for a stout beer while Parker ordered a milkshake (he was kind enough to let Mommy have a sip). I stopped Max when we were exiting so I could snap this shot of the pram on his shoulder. 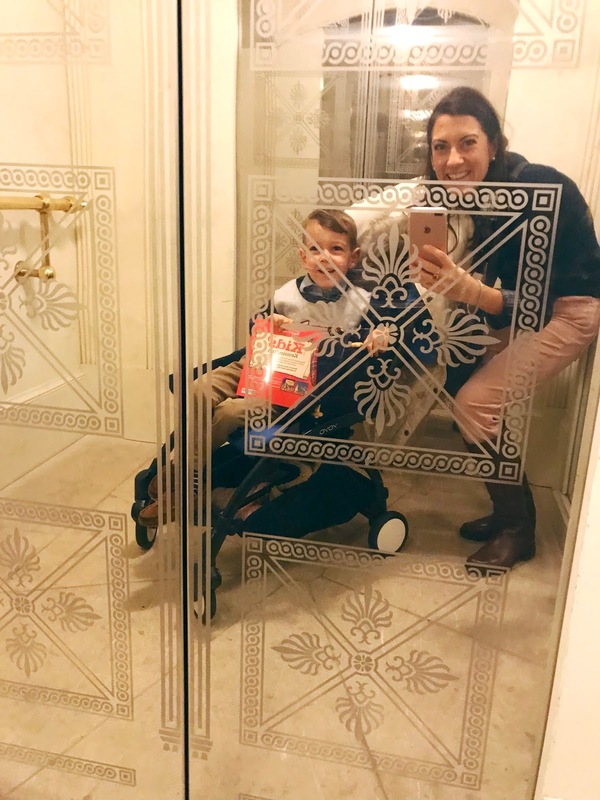 If you are headed to the city, this is the stroller you need! We used AirTots to rent ours for the week - best decision ever! 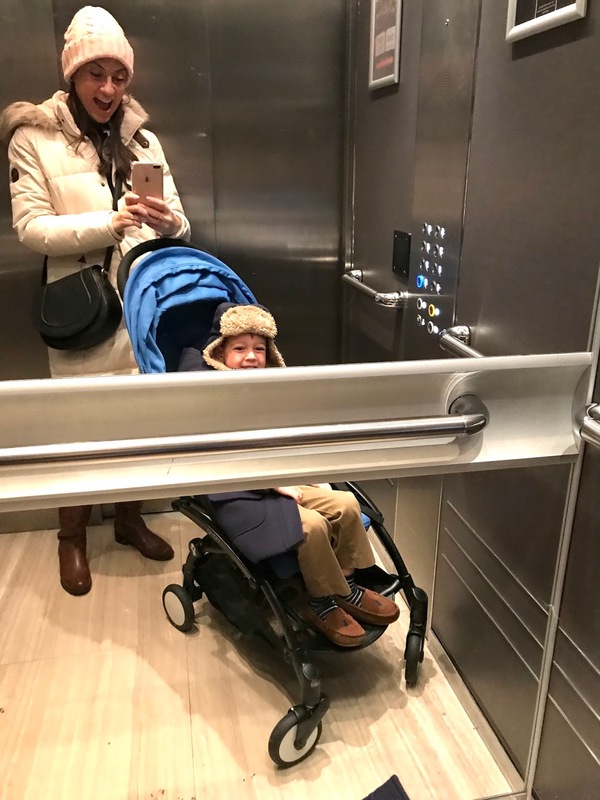 The pram folds out easily and is ready to go in seconds! If you're flying with it, the fold-up size is carry-on compliant for the plane, though we really enjoyed not having to fly with it and just renting for the week. Use code KLEIN10 for 10% off any order with AirTots. 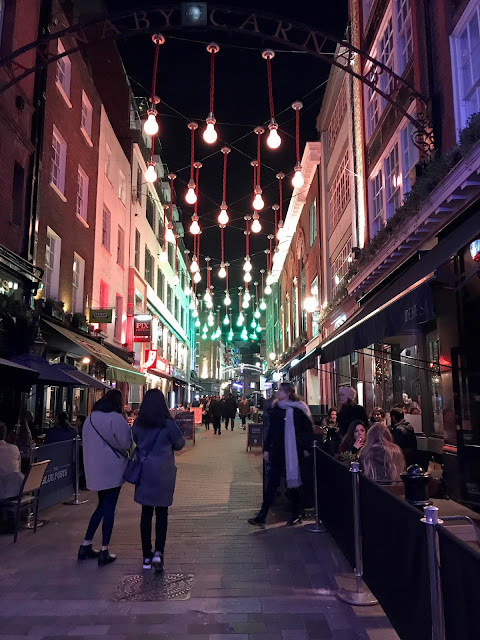 While the Oxford Circus/Picadilly Circus/Shoho areas were fun to see, I'm so happy that we were actually staying in Kensington. It's hard to tell by the photos, but it was quite crowded over there! And the Underground stops in that area were ridiculously packed, so it was nice to be able to breathe again once we got back to our Kensington neighborhood. 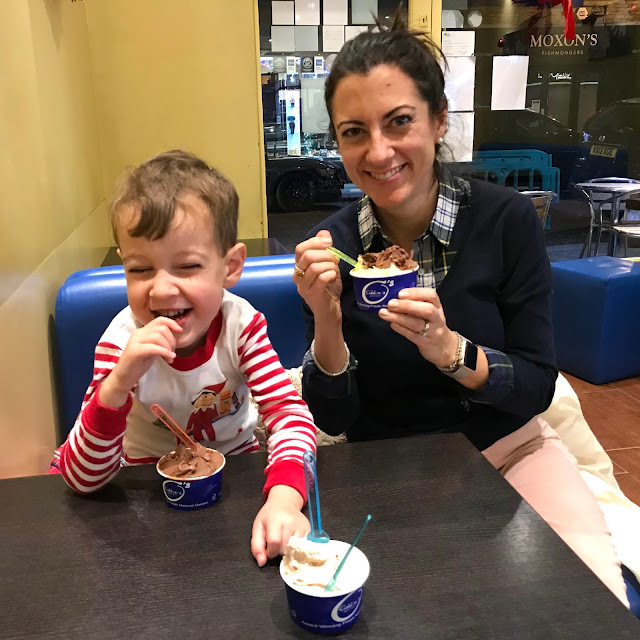 We arrived at our South Kensington hotel around ten, but this Mama had a hankering for some ice cream. I was totally set to walk and get some on my own (Parker was already in pajams) but both my boys joined me. Love. While our little neighborhood was missing the bright lights of the other ones, it was nice to have a bit of space on the sidewalks again! And this housemade small batch gelato? Phenomenal. 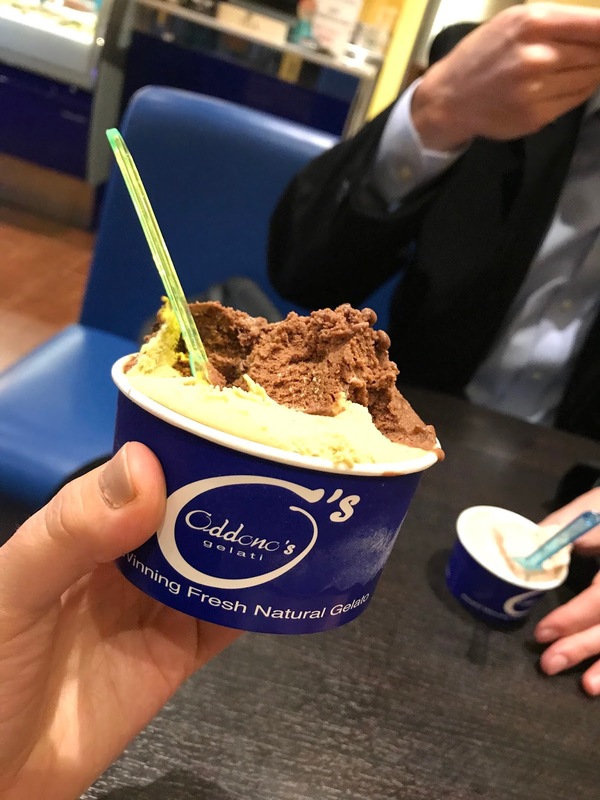 I had the pistachio and hazelnut and dreamt about it that night. If you missed our earlier London recaps, you can read about Day One HERE, Day Two HERE and Day Three HERE. What an amazing trip! I have been enjoying all of your recaps so much!